Taga-alog 2018, Ilog Pasig: Balik Tanaw, Balik Sigla, is a creative campaign for the promotion of the Pasig River as a space for cultural identity and collective memory. A banner project of the National Commission for Culture and the Arts’ NCR-Island Cluster, it was officially launched in June 28, 2018 at Villa Immaculada, Intramuros, Manila. Together with Ramon Magsaysay Awardee, the Philippine Educational Association (PETA) and a host of partners and stakeholders, the project has put together performances, workshops, competitions, site enhancement programs, research and conferences, and adventure tours in an effort to encourage our young people to get involved and be active ambassadors in bringing the Pasig River back to life. 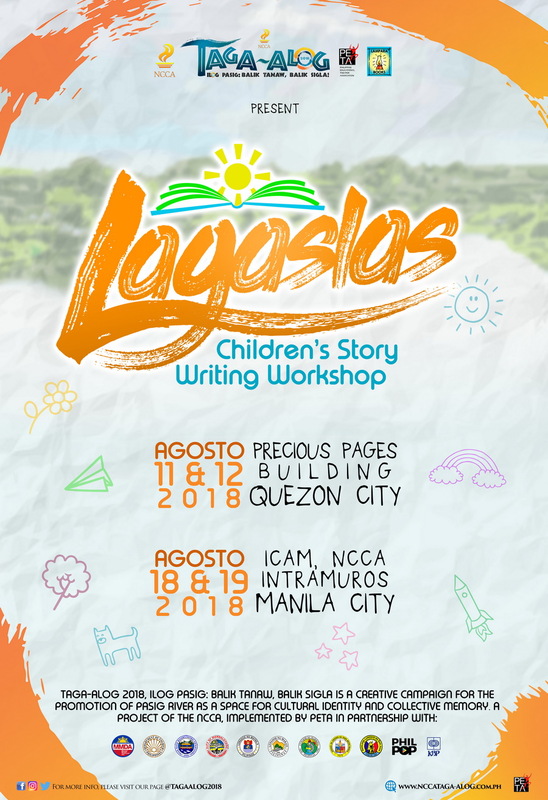 Learn the art of writing stories for children with some of the most respected names in Children’s Literature in Lagaslas, a 2-day workshop designed to teach aspiring writers how to write Pasig River inspired stories for children. To accommodate more participants, two classes are being offered. The first will be held at the Precious Pages Building, Quezon City on August 11-12, 2018 and the second will be at the ICAM, NCCA Building, Intramuros, Manila on August 18-19, 2018. Lagaslas is developed in partnership with Lampara Books, one of the leading publishers of children’s literature in the Philippines. Select participants will also have a chance to have their stories published by Lampara. 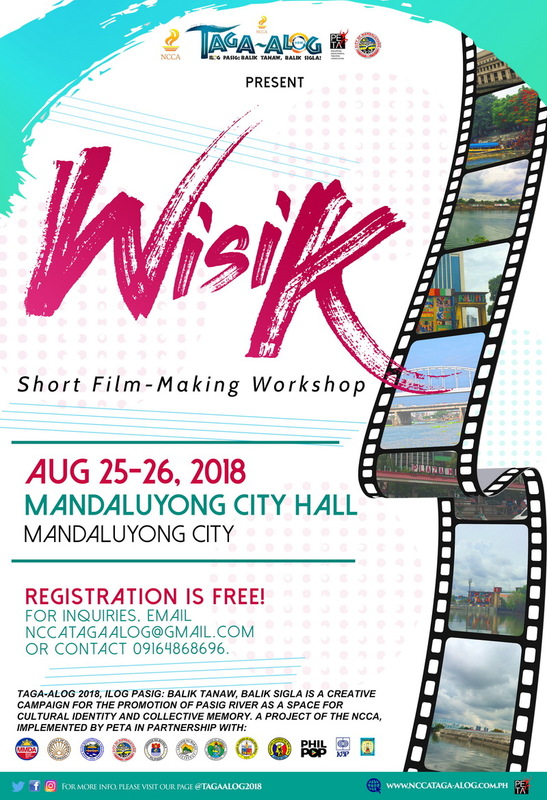 On August 25-26, young aspiring filmmakers will learn how to make short films using smart phones through the “Wisik: Short Film-making Workshop”. Venue is at the Mandaluyong City Hall grounds, generously provided by the City Government of Mandaluyong through its Tourism and Cultural Affairs Office. 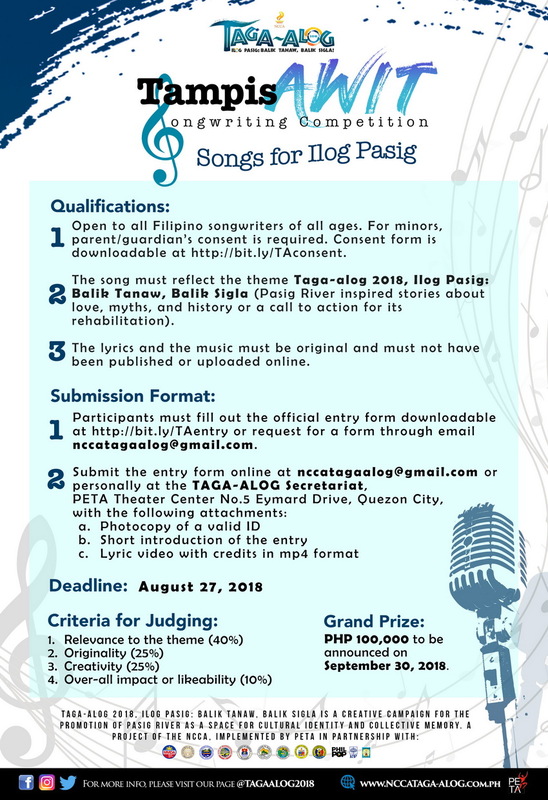 Tampisawit Song Writing Competion is open to all Filipino songwriters. The song entries for TampisAWIT can be in any genre; can have Filipino, English, or Taglish lyrics; and must be submitted in the form of a lyric video in MP4 format. 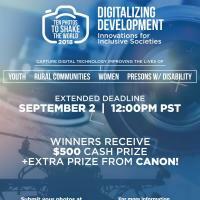 Deadline for submission is on August 27, 2018. 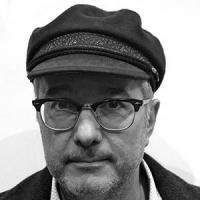 A cash price of 100,000.00 awaits the winning songwriter. LikhAGOS is open to amateur komiks creators only. 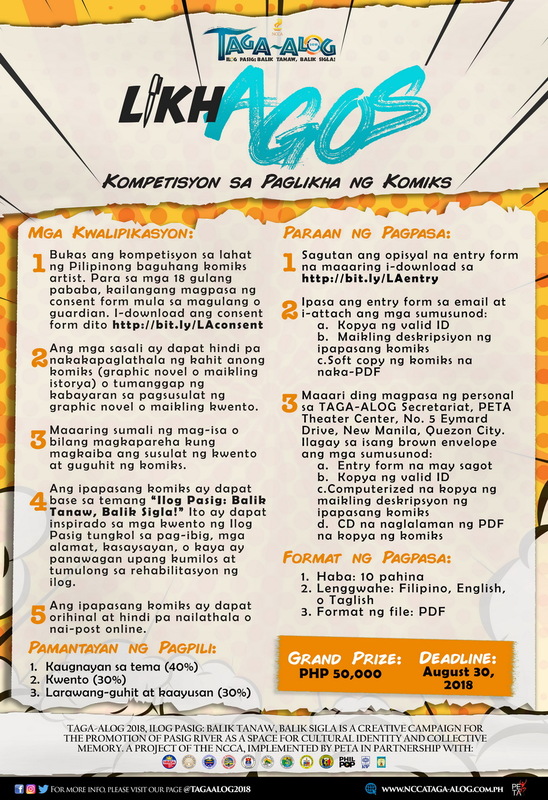 LikhAGOS, the komiks entries can also be in any story genre, can be created using digital or traditional drawing techniques, must be scanned (for traditionally drawn komiks), and must be submitted in PDF format. Deadline for submission is on August 30, 2018. The creator/s of the winning komiks will take home 50,000.00 in cash. Taga-alog 2018 aims to pay homage to the Pasig River by harnessing the rich stories of the river that reflect our traditions, history, culture, heritage and way of life, and using the arts in retelling these stories. Thus, all entries for the competition can be about love, myths, history, a call to action as long as they reflect the theme and objectives of the campaign.